Daleys Fruit Tree has Plants for Sale to Deeragun and can Mail Order them to you door. Click to Find out how much Freight Will Cost. Highly ornamental tree and the source of cinnamon spice. The spice itself is the bark that is peeled from the branches after 2 years. Scrape the bark leave for a day so that the inner bark curls into cinnamon sticks as it dries. The base of the leaf can be chewed for a cinnamon flavour. 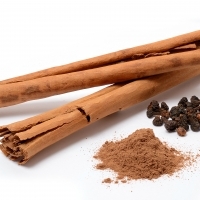 Cinnamon is a very elegant and useful aromatic, much kinder to the palate than the other spice trees.